Total Knee Replacement Market size is set to exceed USD 10 billion by 2024; according to a new research report by Global Market Insights. 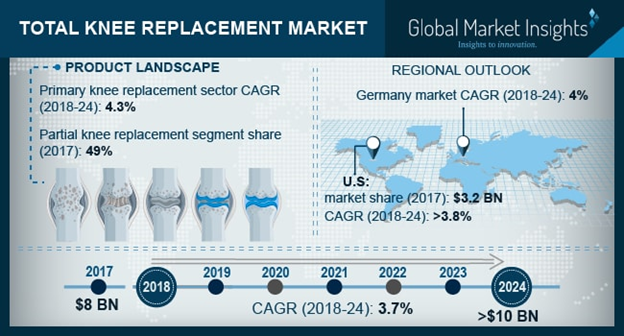 Total knee replacement market will witness a CAGR of 3.7% during the forecast period owing to expanding ageing population pool worldwide coupled with increasing prevalence of degenerative diseases. Geriatric population is more prone to suffer from degenerative diseases such as osteoporosis resulting in demand for total knee replacement procedures. As per International Osteoporosis Foundation estimates, 200 million women worldwide suffer from osteoporosis; therefore, the demand should only increase during the projection years. Tibial knee component market segment will be the fastest growing segment with expected growth of 4.0% CAGR by 2024. This component provides intraoperative flexibility to the replaced component proving to be beneficial in revision replacement surgery. Also, polyethylene tibial component is known to provide significant long lasting clinical results with reduced probability of osteolysis; therefore, the demand for the same should rapidly rise in coming years.